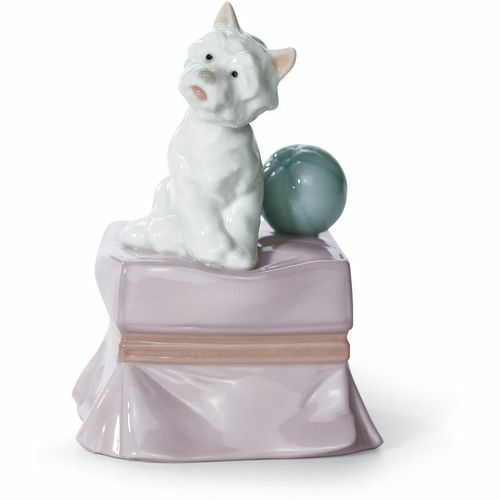 This wonderful glazed porcelain figurine of an adorable little West Highland Terrier Dog who wants to play ball, sitting patiently on a pink foot stool with a blue ball, is perfect for a loved one who perhaps has a dog of the same breed. Lladro Porcelain is produced by Artisans in Valencia in Spain. Lladro is made for memories, these beautiful classic and timeless creations make the perfect gift for all those special occasions throughout the years and make wonderful keepsakes for family & friends to treasure. Each piece is lovingly handmade and hand painted & comes with their unique Lladro markings by the Valencia Artisans. The Lladro My Favourite Companion comes presented in its Lladro presentation box & a certificate of authentication.